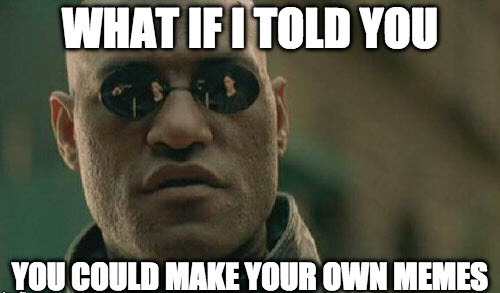 Memes are a rage right now, and if you know how to make them, then you are the new coolest person. So how can you create memes on your own with the pictures that you took on your iPhone? It is really easy; just with some meme generator apps, you can effortlessly make memes as you want even with your own photos. One fantastic aspect is that most of the meme making apps are free so you can download as many as you like and get creative with it. 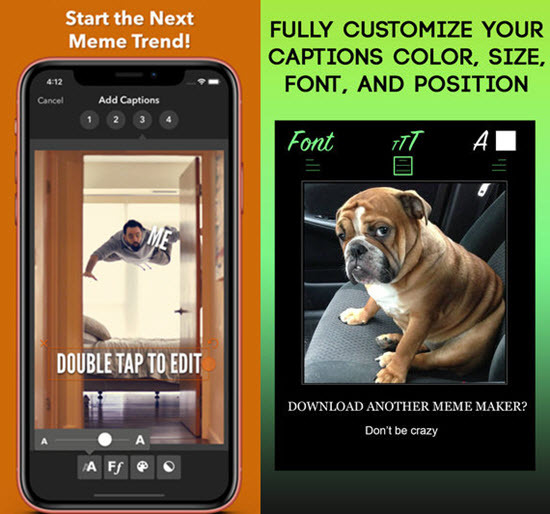 So if you badly want to be a meme lord, take a look at the simple guide to make meme as well as the top iOS meme apps that can help you achieve your dream. 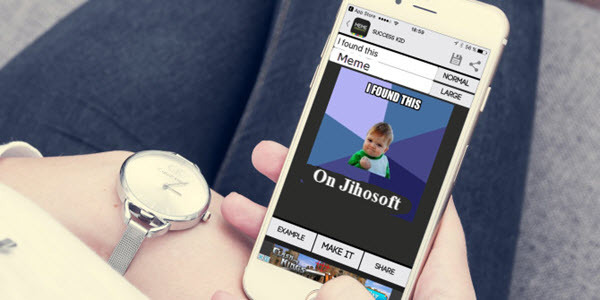 Tips: If you lost any precious photos or pictures on iPhone, you can always use Jihosoft iPhone Data Recovery to get back the deleted images from iPhone or iPhone backup. Proboably lots of people still have no idea what a meme is. Basically, it’s a video cut or photo particularlly extracted from some sources with specific words on it to convey funny or other meanings. There are some common meme templates created solely for entertainment on the Internet. And if you make a hit meme, they will spread like wildfire through tremendous Netizens. If you use a lot of social; media like Facebook or Instagram then it is normal that you have come across memes before. Now we are going to begin the class on how to make memes all by yourself on your iPhone. Memes Generator + Meme Creator: Has the maximum free customisations you can find in an app. Great performance. Meme Maker: Organizes the templates of the meme in a really smart way. Mematic: Simple and fun to use; also takes less space. Meme Producer: This app is really easy to use, so it is good for the newbies. Pictophile: This has numerous free meme making options. After installing a meme generator app on iPhone just follow the steps below to create your own memes on your iPhone. If you want to get the basic idea of the meme culture and the popular memes on the internet right now, then you will need to select the 3 line icon on the top left corner (or other icons according to your meme app). Most of those meme apps offer option to look and browse the popular, and the latest memes of the internet. You can browse to get a good idea of the meme trend. If you know a meme by its name then you can just search it to generate; or you can use related keywords if you don’t remember the exact name of the meme. Once you have found the exact meme image, tap to open it. This will make the template available to you, and you can do anything you want with this meme. In the bottom portion of the screen, you will find some sample text to fit on the image. They will give you a fair idea and inspiration regarding what is going to present in your meme, and hence these examples can be extremely useful in the long run. In order to edit your caption, you will need to tap the text bar over the top, so later the text will become editable. You can erase all the existed writing and rewrite the text in your words to make your very own customized meme. If you still need to customize the image with any other option, then you will need to tap on the top right corner of the screen. This is going to customize the entire caption as well as the meme image options. Then you can either save your meme or share it with the world. If you get on the save option, then the meme will be saved in the in your iPhone Photo app. If you chose to share, then you will get various platform to share on, and your friends as well as other people will be able to see the meme. One thing to keep in mind is that the app options will vary from app to app. However, the basic layout and the basic steps to make and save a meme will remain the same. So no matter which app you use, these steps can be really beneficial for you. You can always use any template found in the library of the free app. However, the real fun lies in creating your own memes using your own photos. This way the memes are going to be really original and unique and they will have a personal touch because the used images will not be the usual templates available to all people. So are you curious about how to make memes with your own photos on iPhone? Let’s take a look at these immensely easy steps. Open your meme maker app, instead of searching and selecting a template, tap on the camera option to take photo or directly choose from your photo library. Both of them will give you the freedom to use your very own image other than the predefined templates already present in the app. The app will ask you for your permission to access the camera or the photos app and based on that choose the OK option to give it permission. Up next choose the image you want to turn into a meme and then once the image opens on the app; edit the text to create your dream meme. Once the meme has been successfully made you can again choose to save or share. So above all are the things that you needed to know about making meme easily on iPhone. Now that you get the full guide, it’s time to become a meme lord as you want to. If you have any question or suggestion, welcome to share with us in the comment below.